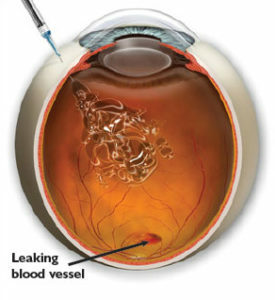 An intravitreal injection is an injection of a medication into the vitreous (the jelly like structure that fills the middle of the eye). Medication is administered directly into the vitreous, as it allows the medication to be placed much closer to where the disease is occurring while decreasing the risk of side effects. A local anaesthetic drop is used to numb the eye prior to any medication being administered intraocularly (inside the eye). Most patients describe a pressure feeling rather than pain, with a slight sting that lasts for less than one second. The anaesthetic drops and special cleaning solution can cause a gritty feeling, but both are washed away thoroughly at the end of the procedure and a lubricating gel is used to help stop any irritation. The benefits greatly outweigh the risks in almost all cases so we urge you to speak with your practitioner if you have any concerns related to your proposed injection.